Want to quickly see how the open-source software Pixelpost works? You'll find a free and updated demo installation of Pixelpost here. We are currently updating the Pixelpost demo. Please check back shortly. There will be a new version up soon. 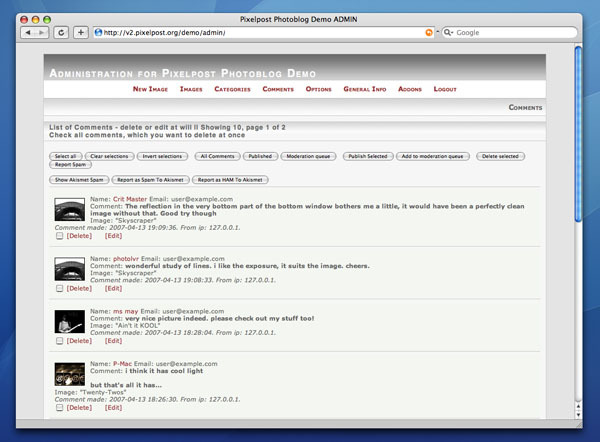 Pixelpost CMS is an open source photoblog application developed using PHP and MySQL, which was first released on February 23rd, 2005. It was created and maintained by bloggers passionate about photography who saw the need to focus on the actual photography through an easy to use and free photoblog tool, rather than getting your blog to work the way you want it to. The last version of Pixelpost to be released was 1.7.3, which hasn’t been updated since September 2009. However, at the time of its release, a Pixelpost demo will show you that this photoblog web app featured a lot of cool features that made blogger’s life a lot easier, like multi-language support and SPAM fighting addons. Pixelpost installation did not require any special skills, but if you’re looking to get a review of the photoblog app, a simple login to an admin demo of Pixelpost will show that it also featured an install assistant meant to guide users through the installation or upgrade process. Pixelpost worked using template tags, which made using your favorite themes that much easier and it also allowed you to setup your RSS or atom feeds in a way that would suit your needs. One of the features that tipped the scale for Pixelpost and turned it into a popular tool was the support of multiple addons, which basically allowed you to extend the current functionality by adding complex features without the need to modify the base code. In terms of requirements, Pixelpost was pretty common as it could run on almost every web server in the world as longs as it had a PHP 4.3 version or greater and a MySQL 3.23.58 version or greater. Although Pixelpost is no longer being developed, you can still download it to get a preview of how everything worked.